THERE were flashes of Turkey 2010 as Red Bull drivers Daniel Ricciardo and Max Verstappen crashed out of the Azerbaijan Grand Prix in spectacular fashion. It was Lewis Hamilton who stood atop the podium at the end of the race, which ended in a manic fashion, with Sebastian Vettel and Valtteri Bottas both throwing away what seemed like certain victory. Vettel had controlled the race for the majority of the race after starting from pole, with the Mercedes-AMG duo of Bottas and Hamilton behind. Behind the leading trio Verstapen and Ricciardo engaged in a lengthy and tense battle, swapping places and rubbing wheels on a number of occasions. READ NEXT: Formula 1 2018: What's changed? Ricciardo seemingly had more pace in hand over his teammate, but the Dutch driver was stubborn in his defensive tactics. The Red Bull duo’s race-long stoush came to a spectacular end shortly after their first and only pits stops in the closing stages. 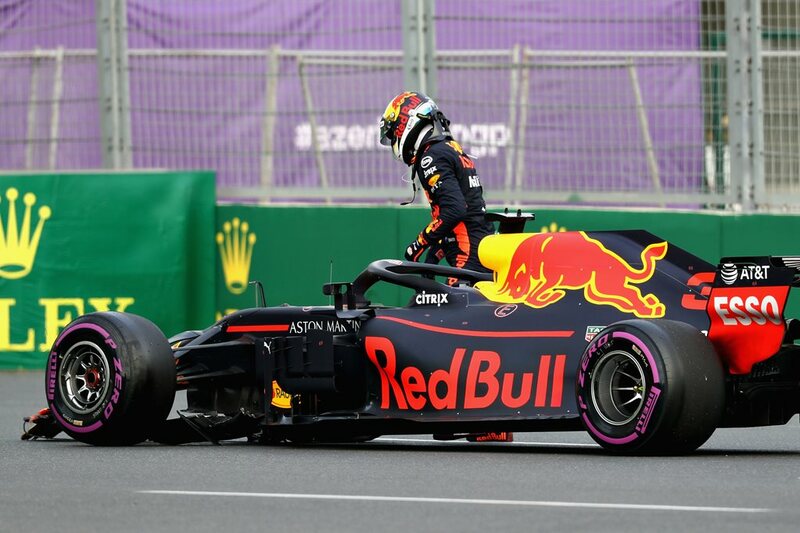 Ricciardo had a run on his teammate, making the most of the 2.2-kilometre Baku front straight. With the gap between the pair diminishing rapidly heading towards the first corner, Verstappen guarded the inside line with jealousy. Ricciardo darted to the right, Verstappen covered. Ricciardo moved back to the left, Verstappen covered again. Two defensive manoeuvres in the braking zone rarely ends well. What resulted was smoke, flying carbonfibre, and two broken cars stranded in the run-off as Ricciardo slammed into Verstappen. Team boss Christian Horner was ropeable, shaking with rage as he stormed to the team garage to accost his two drivers. The post-race debrief is sure to be eventful. While the pair’s collision surely had Australian race fans leaping from their couches, it also brought the 2018 Azerbaijan Grand Prix to life. Mercedes-AMG seemed to have made a tactical masterstroke by running Bottas long in his opening stint, with the Finnish driver leap-frogging Vettel under the safety car, Hamilton was third, with Kimi Raikkonen fourth. Romain Grosjean then crashed under the safety car, extending the final yellow flag period. The Haas F1 driver slammed his car into the street circuit’s unforgiving concrete walls while trying to warm his tyres. The Frenchman quickly jumped on the team radio to point the finger at Sauber’s Marcus Erricson as the cause of the shunt, but TV cameras showed Grosjean only has himself to blame. At the restart Vettel lunged under the leading Mercedes but locked his tyres and found himself in fourth heading towards turn two. Then it was Bottas’s turn to have his chance at victory snatched away. The Finnish driver ran over a piece of metal debris, suffering a near-instant tyre delamination. Hamilton, who had languished in second and third most of the race, now held the lead with three laps remaining. Raikkonen would finish second at the chequered flag, despite being involved in a clash which ended Esteban Ocon’s race on the first lap. Force India’s Sergio Perez was the final podium finisher after dispatching Vettel in the final two laps. Charles Leclerc and Carlos Sainz were the unsung heroes of the race, finishing sixth and fifth respectively. Leclerc’s finish is the first points for a Monte Carlo-born driver since the Monaco Grand Prix in 1950 – the second grand prix in F1 history.